1. Sort out your inbox. I don’t know how some people can sleep every night knowing that there are 1,265 unread emails in their inbox. It’s not just about being an OC, but a clean and organized email inbox is greatly satisfying and it’s also a great way to lessen work-related stress. One easy way of automatically sorting your emails is by learning how to use email filters. Another email declutter tip is to act immediately on emails that require action. Don’t delay. If you can’t respond right away, flag it or mark it unread, so you can easily attend to it again when you can later. 2. Tidy up your address book. Are there still messages in your phone from seemingly unknown sender? Seemingly – ‘cos they are not really unknown, it’s just that you’ve never took half a minute saving these new numbers on your address book. And when you are saving new phone numbers, never save two numbers of the same person, as two separate persons. Most smartphones can save multiple numbers under a single person’s name. This way, you’ll not just save on space but also lessen the confusion. When saving names, try your best to always fill in the first and last names of your contact so you’ll never mistakenly text Karen (the HR manager) and order 2 boxes of pepperoni pizza from her just because you have at least 5 Karens in your contacts. 3. Delete duplicate files. Poor file organization can lead to multiple duplicates. This does not only clutter your device but also makes file retrieval confusing. Start by devising your file naming scheme. If this proves to be still difficult, there are a lot of third-party apps such as Duplicate Cleaner that can help you delete duplicates. For Windows, you can try this technique. And on Mac OS as well. 4. Digitize your old photos. Unless you were born in the year 2000, most of your childhood photos are still in paper form, collecting dust in your mother’s cupboards, which you only clean every New Year or when relatives finally visit and start to make fun of your #throwback photos. Aside from being susceptible to damage, these paper-based photos take a lot of space. Digitizing your photos saves a lot of physical space. On average, a 1GB storage can store up to 700 to decent-sized photos. This proportion means that your entire cabinet full of photo albums can be condensed in just a single memory card that can fit in your palm. Now that’s a lot of space saved! But this doesn’t stop here. Even though the photos already got digitized, there are still threats waiting to happen to the hardware device that stores your photos. This is where the cloud comes in. 5. Back up your data. If you still don’t use THE CLOUD, then, my friend, you need to update yourself a little bit. Few years ago, it was forecast that the cloud is the future, well, the future is now. Today is the CLOUD era. Gone are the days of boasting about your $500 fireproof safe storage. You will still be a laughing stock among tech savvies if you have never used the cloud in backing up your most important documents. We’ve said this before, but okay, let me say this again: physical storages – no matter how expensive these may be – are highly susceptible to damage and loss. Worse, this kind of storage takes so much space. So how does backing up in the cloud happen? It’s simple. Instead of a local server or a PC, your data is being stored in a network of remote servers hosted on the Internet to store, manage, and process data where there is redundancy. Let me tell you about Enadoc. Enadoc is an innovative, disaster and compliance-ready, document management solution that is mobile-ready and cloud-based (Microsoft Azure). It operates on the premise of Capture. Tag. Find. Do. Learn more here. 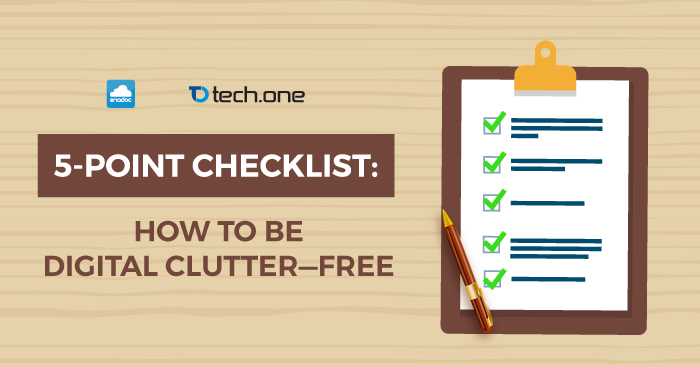 Cleaning up the clutter on all your devices may take some time up front, but once you start organizing, maintenance will be easier. And if everything goes well, decluttering your digital crap will not be a part of your new year’s resolution 2017. Start the year right. Cheers to a clutter-free 2016!